When you are craving delicious, Southern-style food at great prices, then chow down at Phamous Phil’s BBQ & Grille. This award-winning restaurant has been serving up phenomenal fare that has hungry guests coming back time and time again. Start your dining adventure off with their great appetizers. Some favorites include their Delicious Smoked Jumbo Wings, Smoked Pickle Chips, Boardwalk Fries with cheese, and their quesadilla options. Another solid selection are the Southern Fries that are covered in a pulled pork and shredded cheese blend. For your main course, Phamous Phil’s has options like sandwiches, ribs, various meats, sides, and hot-off-the-grill selections. If you are in the mood for a sandwich, we recommend the Smoked Pulled Pork Reuben that is stuffed with Swiss cheese, coleslaw, and Russian dressing – all on grilled rye. If you came in for ribs, then try the St. Louis Pork Ribs. These savory rubbed and glazed ribs are large and have very little fat. Other meat selections include the Smoked Meatloaf, Sliced or Chopped Brisket, Western Pit Beef, Pulled Pork, Pulled Chicken, and the Smoked Chicken Salad. Further menu selections that are certainly worth a try are the Pit Beef Cheesesteak, Pulled Chicken Cheesesteak, Buffalo Chicken Cheesesteak, Pulled Pork Chesesteak, and Chopped Brisket Cheesesteak. Complete your meal with great sides like their Phamous Phil’s Signature Blend Baked Beans, Macaroni and Cheese, Potato Casserole, Homemade Corn Muffins, Homemade Cole Slaw, Sweet Potato Fries, the Vegetable of the Day, or the Macaroni Salad. 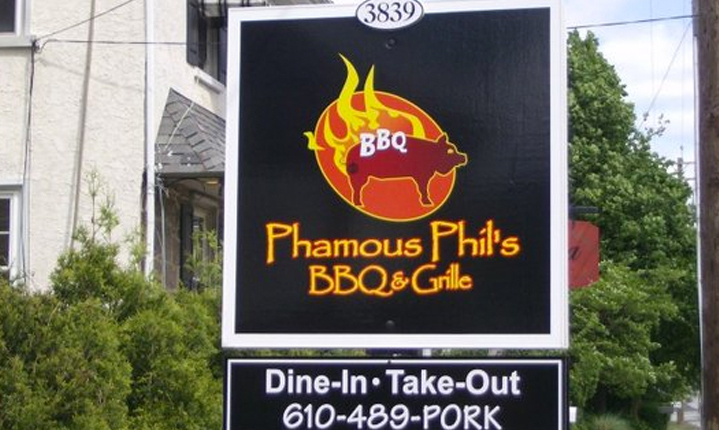 So the next time you are looking for a delicious meal, stop in at Phamous Phil’s BBQ & Grille and see why they are such a popular place to have a meal. They are located at 3839 Germantown Pike in Collegeville Lower Providence, PA. For more information, call them at (610) 489-7675 or visit their official website by clicking here.